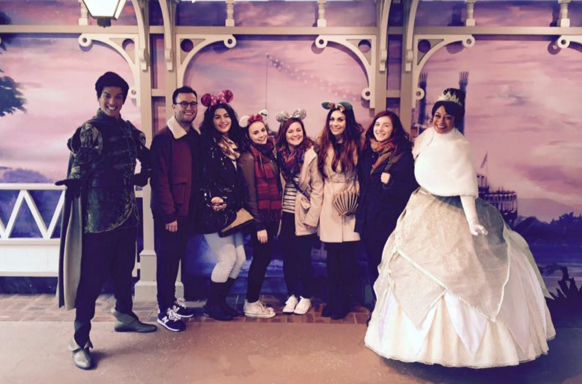 Ready for the second instalment of my Disneyland Paris trip? 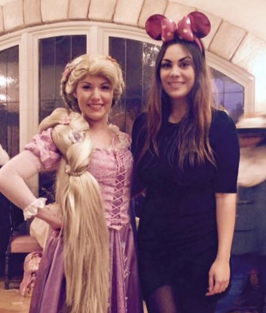 I hope so because this post is about probably my favourite thing in the Disney Parks; meeting Disney Princesses! 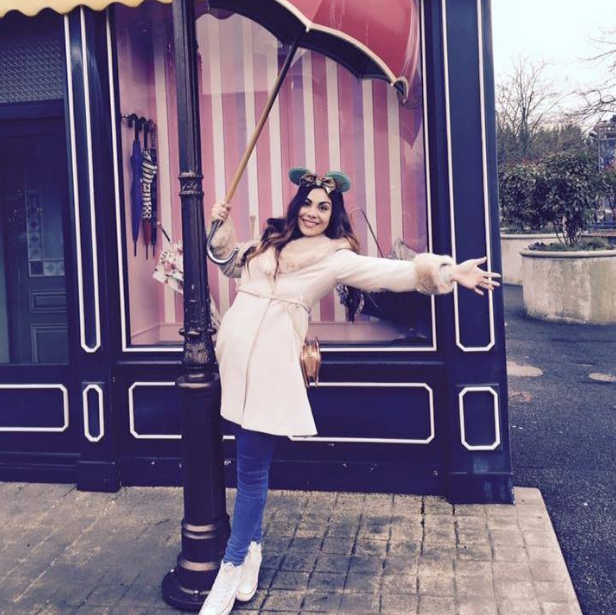 I was at Disneyland Paris for five days at the beginning of February so anything posted regarding character meet and greets will be based on my experience at that time. 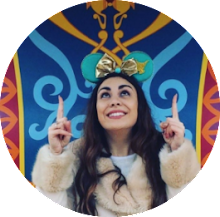 I have put together a pretty comprehensive list for you all consisting of each of the 'official' Disney Princesses and where you can meet them currently at Disneyland Resort Paris. Auberge de Cendrillon - Auberge de Cendrillon is a restaurant located within Fantasyland in the main Disneyland Parc. If you choose to dine here, you will pay €66.99 per adult and €37.00 per child for three courses and of course, the incredible experience of dining with the Disney Princesses. Whilst this may seem expensive, this is quite simply the easiest way to meet with the characters in a leisurely, relaxed atmosphere. 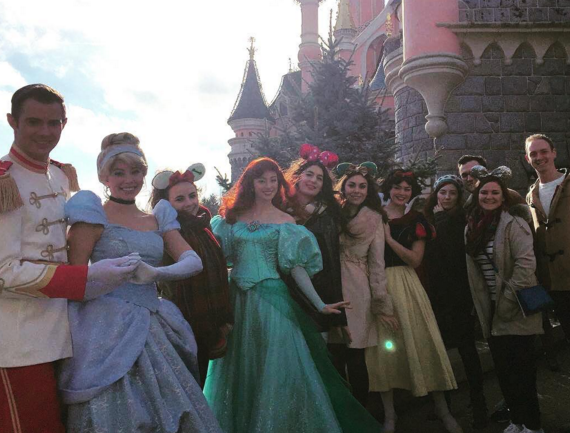 You will meet with three Princesses including Cinderella, one Prince and Suzy and Perla. Snow White is never guaranteed at Auberge but when she does appear it is often with her Prince. Disney Magic on Parade! - This is the only parade on currently at Disneyland Resort Paris and features Snow White with her Prince. You can view the whole parade here. Auberge de Cendrillon - As the name may suggest, this restaurant is based on the château where Cinderella grew up. She is currently the only Princess guaranteed to appear here along with her mice friends Suzy and Perla. She occasionally has Prince Charming with her also. Disney Magic on Parade! - Cinderella features with her Prince Charming. The Fairy Godmother is also in the parade with the other Disney fairies. Meet 'n' Greet with Aurora - As it's Sleeping Beauty Castle in Paris, there is of course a designated meet 'n' greet area for Aurora. She is located in Fantasyland by the exit of 'It's A Small World' from 10.45am - 4pm. I believe there is currently a fast pass style system in place here which invites you to return a designated slot later in the day so don't worry about lengthy queues! Disney Magic on Parade! - You can see Princess Aurora here with Prince Philip. Flora, Fauna and Merryweather open the parade. Auberge de Cendrillon - Ariel is one of the Princesses that sometimes pays a visit to Auberge. She can be seen here with Prince Eric on occasion. 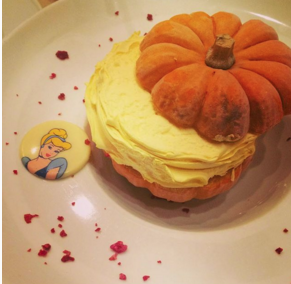 Auberge de Cendrillon - Belle is one of the Princesses available to meet at Auberge. She sometimes visits with Prince Adam. 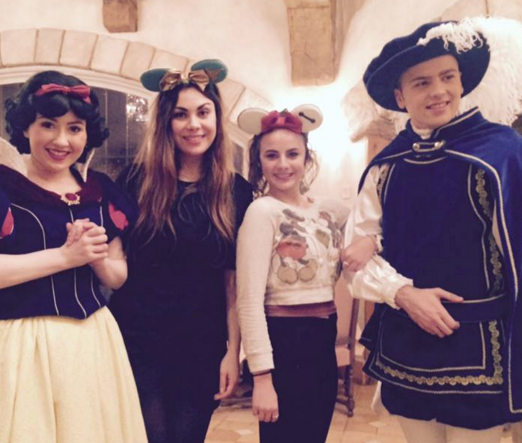 Top Tip: Auberge is currently the only place in the world that you can meet the Beast in his human form. Ratatouille Fountain* - On occasion, Belle has been known to appear in her blue village dress by the Ratatouille fountain located in the Parisian section of Toon Studio in Walt Disney Studios. This is very ad hoc and certainly not a Meet 'n' Greet location on the programme but lots of people have reported seeing her here. 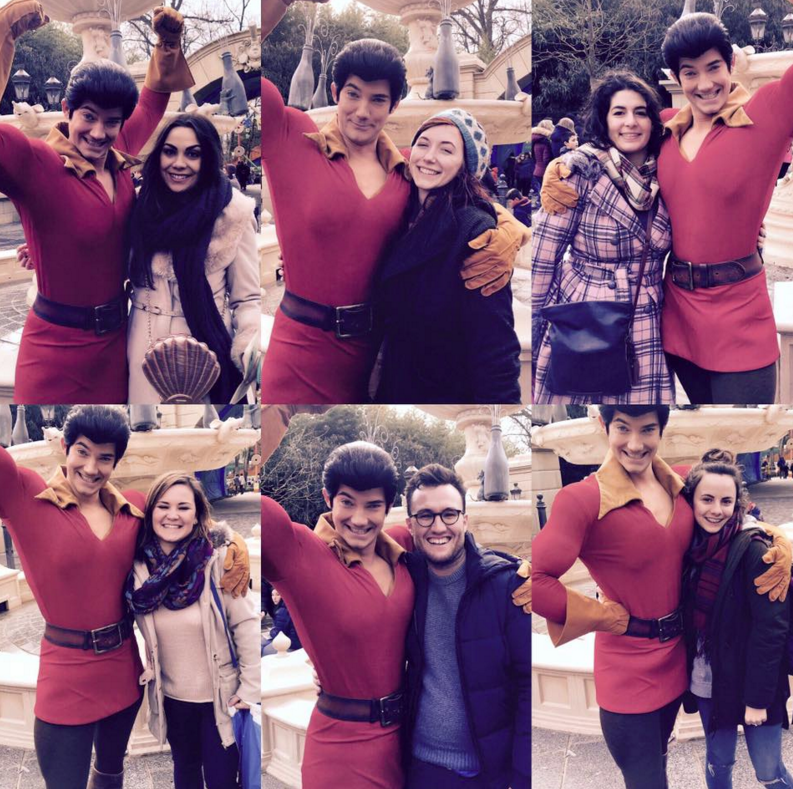 During my trip, I was fortunate enough to see Gaston at this location but sadly, no Belle. Meet Aladdin or Friends - Jasmine is my favourite Disney Princess so I was very disappointed to see such a lack of her in Paris! 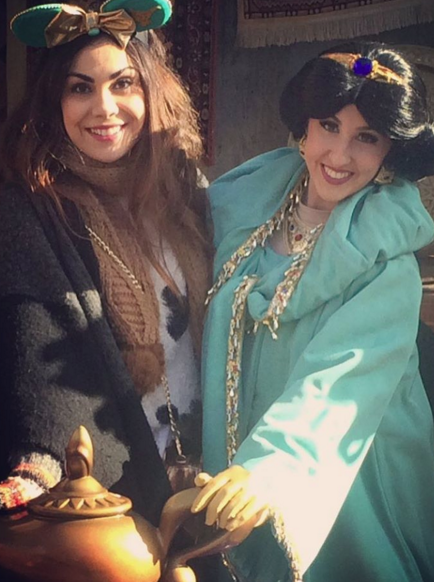 Fortunately, she was one of the 'friends' available to meet on our last day at the Aladdin meet 'n' greet so I got to see her... and show her my personalised, custom made Jasmine mouse ears! You cannot meet with Pocahontas at Disneyland Paris at present. A new show was opening the week after we left, The Forest of Enchanment and it features Pocahontas and John Smith. You can view it here. You cannot meet with Mulan at Disneyland Paris at present - although, on occasion, she has been known to pay a visit to Walt Disney Studios, simply walking around the central hub! Meet Princess Tiana or Friends - Tiana has her own meet 'n' greet area in Frontierland. She is usally with Prince Naveen although the programme simply states 'Tiana or Friends' so I imagine Louis is sometimes there or Dr. Facilier? But that is just a guess. Auberge de Cendrillon - Rapunzel often appears here and sometimes with Flynn Rider. Disney Magic on Parade! - Rapunzel is featured in the parade with Flynn. The Forest of Enchantment - This show (see Pocahontas) features Rapunzel and Flynn Rider too. 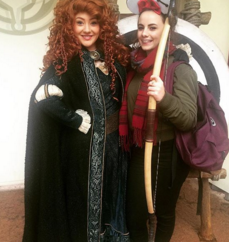 Merida Meet 'n' Greet - There is currently a Merida meet 'n' greet in Frontierland but as it's not listed on the programme and is tucked away, not very many people know about it. I would advise going straight there at around 10.30am to beat the queues! 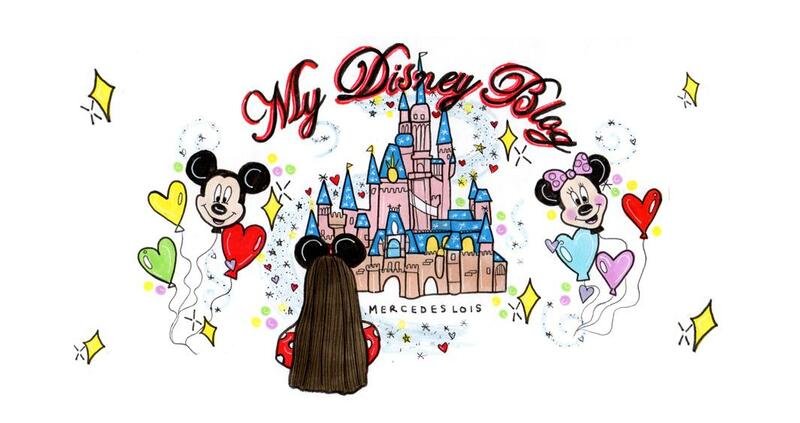 Disney Dreams! - There is quite a large section of Disney Dreams! that features Merida and the music of Pixar's Brave. A must see for any diehard fans. The Forest of Enchantment - This show features Merida. Disney Magic on Parade! - Anna can be seen on Parade with Elsa and Olaf. Disney Magic on Parade! - Elsa can be seen on Parade with Anna and Olaf. If you have any additional questions, as ever, please send me a quick note in the comments. *Edit: This location was missing from a previous post.